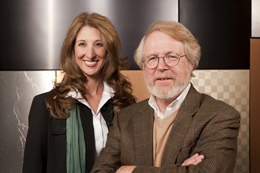 Christine Langley, COO, and Jonathon Benson, chief executive officer of the Wyoming Technology Business Center, provide consulting expertise to start-up companies in Wyoming that are building their business through an incubator environment at the UW facility. 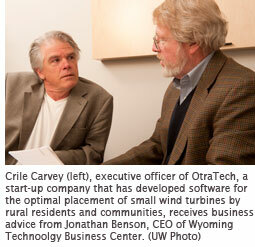 Part strategy consultant, part mental therapist and all business, the University of Wyoming's statewide business development program has assisted four visionary startups -- all with offices in Laramie -- with turning their dreams into part of Wyoming economic reality during the past six years. In all, these four businesses employ approximately 65 persons with gross annual revenues of $10 million contributing to the state and local economy. Much like an egg eventually hatching into a chicken (thus, the incubator terminology), the WTBC takes new businesses through four stages of development. Stage 0 is the pre-venture stage, the period when a client has a business idea and is in the process of evaluating its feasibility. Whether to fully pursue the development of the idea is decided at this stage. In this stage, the WTBC assists the client in developing a business concept, which includes an overview of the problem and solution, product, customer, market size, competition, marketing strategy and sales strategy. In addition, the business's feasibility is determined through a cash-flow analysis. "During the pre-venture stage, we work with a lot of people thinking about getting into business," Benson says. "We have a lot of prospects, with a lot coming out of the university." Some of these UW students looking to start businesses receive their $10,000 seed money from winning the UW College of Business John P. Ellbogen 30K Entrepreneurship Competition (the former UW College of Business 10K Entrepreneurship Competition was renamed in 2011). The competition encourages UW students to act on their talent, ideas and energy to produce tomorrow's businesses. "We work closely with the COB. We actually have three companies (Pronghorn Technologies, TigerTree and Bright AgroTech) that spun out of the entrepreneur competition," Langley says. "We see opportunities where a lot of other people may not." Those that seek assistance and expertise from the WTBC are encouraged to create business-to-business ventures, rather than business-to-consumer operations. "B2B is an easier type of company for an individual entrepreneur to develop," Benson says, noting business-to-consumer ventures often require large amounts of research and development dollars -- dollars that might not necessarily be easy to come by for start-up companies. "There are a lot of barriers to business-to-consumer," Langley warns. "When we talk to students, their first idea is typically business-to-consumer. We try to migrate them to B2B ... If you can offer a service, you can build your cash flow pretty quickly." However, there are success stories where a business's main focus is business-to-consumer, but it offers a B2B service to reach that goal. For example, Benson says Happy Jack Software's (an incubator client that graduated from the WTBC in November 2010) main focus was to develop a specialized type of software called CALibrate, a web calendar software that makes it easy for companies to share, publish and manage calendars online. To create a cash-flow stream to develop that software, the company built various types of software for other companies. "It gave them the cash-flow to build their product and then go sell that product," Benson said. During Stage 1 of the incubator process, the start-up client creates a company and begins the pre-revenue and initial sales phases. The pre-revenue phase for WTBC staff includes assisting in the formation of the business entity; establishing a financial information system; and creating a product development plan with established benchmarks and deadlines to manage research and development. In addition, business feasibility is demonstrated through various prototype tests. If a go, implementation documents are finalized. During the initial sales phase, WTBC counseling includes helping the business close its first sale and develop a sustainable business model. This is accomplished through sales, which includes determining competitive advantages, understanding of pricing, product delivery and support of the product. "What is the problem you're trying to solve? Who is your customer? Why will that customer buy from you? What is your sales strategy? Who is your competition?" are all questions these incubator businesses have to ask, Benson says. And, of course, there's the issue of money. Like the example of Happy Jack Software, entrepreneurs are encouraged to build capital for the work they really want to do. However, that approach is not a one-size-fits-all. Often, clients apply for Small Business Innovation Research (SBIR) grants to cover their product feasibility studies. Such grants can typically provide $75,000 to $150,000 in start-up funds for new businesses, Benson says. During Stage 2, or the first growth phase, the client projects revenue 3-6 months in the future. During this stage, company sales increase and the focus is on building a strong business team. SBIR grants can range from $750,000 to $1 million in this stage. "That (money) funds research and development," Langley says of the importance of such grants. "Venture capitalists don't want to invest in a long shot. The business is not at the point of selling anything yet. It's difficult to project revenues. You're not sure if it will work." By Stage 3, the goal is to stabilize the business, with an emphasis on growth and development. Counseling includes analyzing sales, information, financials and human resources. At this time, the WTBC helps the client understand cause and effect in sales marketing; create a management team and departments; formulate organizational structure and human resources processes; establish information and financial management controls; and begin strategic planning. "It (success) often comes down to the quality of people you hire," Benson says. "You have to be highly differentiated (from your competitors). If you have a killer sales force, you win." The last stage of consulting revolves around a business creating a strategy, Benson says. Defining a customer base, identifying your competition and deciding how to grow your business are all key components, Benson says. The WTBC becomes heavily engaged in the step-by-step process of helping entrepreneurs build their businesses. At the same time, Langley says the center meets with clients twice a month, but does not want to become an "extension employee" of the business it's assisting. And Benson adds that the WTBC provides no money to its clients, only space and business expertise as part of a services agreement. To help start-up businesses build confidence, the WTBC often brings in successful Wyoming business persons -- many of which started in the incubator -- and have them tell their rags-to-riches stories. This is done through e2e, an entrepreneurial networking group designed to foster an entrepreneurial climate and, ultimately, lead to an increase in new business creation and growth for existing businesses in Wyoming communities. Five meetings are held annually for entrepreneurs to meet with other entrepreneurs and business service providers. "We bring in people who've done this before and have them tell their story," Langley says. "It's inspirational." "You learn from other people," Benson says of speakers who pass on their business knowledge and experience. "You expose them (incubator clients) to real (business) people and they tell how they've succeeded ... Often, this leads to forged relationships and deals struck." "I actually think this is unique," Langley says of the WTBC's approach to business development. "Very few (business incubators) have the type of features that we offer. A lot (of others) work with real estate deals. But our business coaching and consulting in phases is really unique." "We do see the same things over and over. Through trial and error, we have a sustainable success model," Benson says.